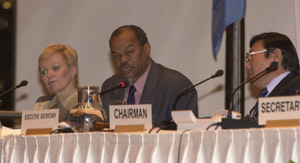 CCD Executive Secretary Diallo said COP-4 had succeeded in coming up with conclusions to further the implementation of the CCD. He noted the results of the AHWG stating that these had met Parties’ expectations. He highlighted other achievements including, on the additional implementation annex, the declaration, proposals to improve the work of the CST and the decision related to the GEF and how to enhance access to that body to assist countries with CCD implementation. Nigeria, for G-77/China, thanked the COP President, the Bureau, Executive Secretary, Secretariat and fellow delegates. He highlighted actions needed to assist affected and the need for new and additional funding as well as steady and predictable sources of funding. The COP President highlighted positive aspects of the two-week COP meeting, assured his commitment to making the Convention a tool for changing peoples lives in affected areas. He closed the session at 11:30 pm. Catch-up on the latest news, information and analysis from international environment and development negotiations with Linkages Journal. Each month, Linkages Journal - the sister publication of Earth Negotiations Bulletin - updates readers on what's been happening and what to expect in key negotiations and processes, including those on climate change, forestry, desertification, biodiversity, wetlands, ozone, chemical management, trade, and development.